TORONTO - Kevin Elliott is thankful to be back playing football. The lanky receiver returns to the Toronto Argonauts' lineup Friday night when they face the Montreal Alouettes at Tim Hortons Field. Elliott missed last weekend's 27-15 loss there to the Calgary Stampeders following the death of his maternal grandmother, Madear. "I missed my guys, I feel good being back up here," Elliott said following Thursday's practice. "It was good for me to go back home and be with my mom. "It's always tough because we play football and we want to play in the game but coach Milanovich told me to go home because family always comes first." There was no question in Milanovich's mind about what Elliott had to do. "He was asking me what I thought and I just said, 'You need to go,'" he said. "This is important, it's our livelihood and a lot of people depend on what we do here but to me it's not family. "It was important he be there, he needed to be there." Elliott has been a big-play receiver in his first season with Toronto. The six-foot-three, 205-pound native of Fayetteville, N.C., has 42 catches for 551 yards but his eight TD grabs leave him tied for third overall among CFL receivers, just two behind teammate and league leader Tori Gurley. 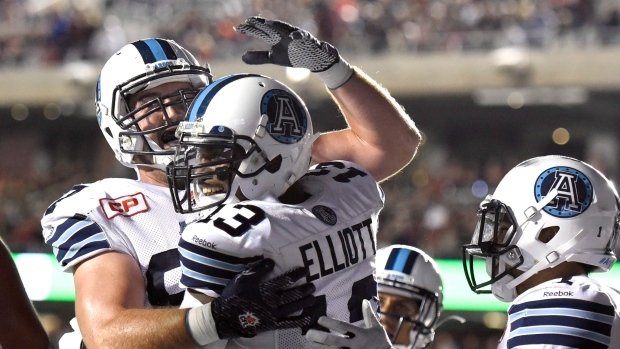 "He's a big part of our offence," Argos quarterback Trevor Harris said. "He's physical, he's a great route runner, he can make people miss in the open field. "We've found ways to get him the ball and we're just excited to have him back." But Milanovich said Elliott provides more to Toronto's offence than just another set of strong hands. "He's extremely physical and plays a position that's difficult to play," Milanovich said. "We also ask him to do a lot in the run game with blocking. "From a locker room standpoint he's a spark plug for our team, he's an emotional leader. He's got that kind of moxie, that kind of a sense about him our players feed off." But Elliott said he's been feeding recently off the support he's received from Milanovich, his coaches and teammates. "It's really reassuring," he said. "It feels really good to know (Milanovich) has my back and my teammates and everyone understood as well and they'll never know what they've done for me and how much they've kept my spirits up. "I mean, she was my Nana. It's a big loss. I've still got a big piece of her that I always carry with me. It was a good celebration, a good sendoff. She's moving on right now." Elliott will forever cherish the memories of visiting his grandmother in Mississippi each summer. "I loved spending time hanging out in the country and getting that grandmother love that everyone loves," he said. "And you can't beat that (grandmother's cooking)." One of Elliott's most prized possessions is a quilt his grandmother made especially for him. "I sleep under it every night," he said. "I remember when she first gave it to me I said I'd never leave it anywhere, I'd always bring it with me and sure enough it's with me right now. "Just wrapping up in that quilt, I feel her love in it. She put that in it for me." Although he'll play Friday with a heavy heart, Elliott understands what's at stake for both teams. Toronto (9-6) has clinched a playoff spot but is still gunning for top spot in the East Division while Montreal (5-10), despite having lost four straight, remains in contention for the final West Division post-season berth. "We're treating our final games like we have to win them to get into the playoffs," he said. "We're not overlooking them just because we've solidified a playoff berth." Toronto's final opponents — Montreal, B.C. and Winnipeg — all have losing records and the Argos have beat each one this season. Toronto is tied with Ottawa (9-6) for second in the East. To finish first, the Argos must win out and have Hamilton (10-5) lost two of their final three because the Tiger-Cats won the season series, which will determine the standings in the event of a tie. Toronto will play its fourth home game at a neutral site this season, having compiled a 1-2 record. The Argos had to move their last two home games from Rogers Centre with the Toronto Blue Jays being in the baseball playoffs.